The United Parcel Service, Inc., commonly referred to as UPS, was founded in 1907 in Seattle, Washington, by James Casey. Nearly one hundred years later the company has become the most successful provider of supply chain management solutions and delivery services in the world. According to a recent statistics, UPS delivers roughly 15 million parcels in a single day and services around six million customers across 200+ countries. You will recognize UPS delivery boys by their infamous brown uniforms (they are also the reason why UPS earned its nick name: Brown). UPS operates its own cargo and airline delivery lines, besides regular UPS ground shipments. UPS bears the hallmark of Excellency because it consistently makes efforts to improve the quality of its services by listening to customer feedback. The UPS package tracking and shipment services have been tweaked to perfection and, nowadays, they offer a plethora of options for undecided customers. Each service comes with its unique set of advantages and disadvantages, so you should ensure that you choose the perfect one for you. UPS also has a wide selection of package tracking options that you should try. In the following guide we will discussing about the best UPS package tracking methods, estimated delivery dates and solutions for delayed (or cancelled) shipments. Open your digital inbox and create a new message. Add totaltrack@ups.com in the recipient field. For a single tracking number you have to write the tracking number as the mail’s subject. If you want to track multiple tracking numbers at the same time you have to write all the tracking IDs down in the body of the email. You don’t have to create a subject line. Click on send and wait for the automatic tracking response. Keep in mind that freight shipment tracking is not supported through email. The second most popular tracking method for parcels is through the personal dashboard. This feature offers an integrated view for the entire supply chain and is recommended for customers with multiple worldwide shipments. You can register an account with UPS by clicking on this link. All the information you need to start package logging is contained within the dashboard. You might not have heard about this UPS package tracking feature. That’s because it was designed for the monitoring of hundreds of packages. Flex Global View Tracking is recommended for supply chains and online retailers who are responsible for the safe delivery of multiple orders. This shipment managing tool will give you total insight and the ability to respond and resolve problems as they occur. Flex Global view will update information such as freighter, date, package status and location in real-time. Still unsure how to track UPS package? Maybe this solution will appeal to you. It is possible to create unique order or customer numbers for your shipments (up to 35 characters). These references can be used to manage ongoing deliveries. The web-based tool will enable you to track up to 25 InfoNotice numbers for package, freight and mail services with a few clicks. You can use details such as Shipper account, date range, reference or ZIP code to identify your desired package. It is also possible to save tracking numbers by logging into your account. If you have an account with UPS you will be happy to know that you can create a history of shipments (up to 50 tracking numbers) that you can access at all times. You can also change the details and description of shipments effortlessly and gain a broader perspective on your recently tracked deliveries. The number of shipping options available at UPS is staggering. Naturally, the time of delivery varies according to the type of services. We will try to go through the most popular shipping options and mention their estimated durations. Please keep in mind that these time frames serve as reference, and they may alternate in accordance to package size, location and transport method. 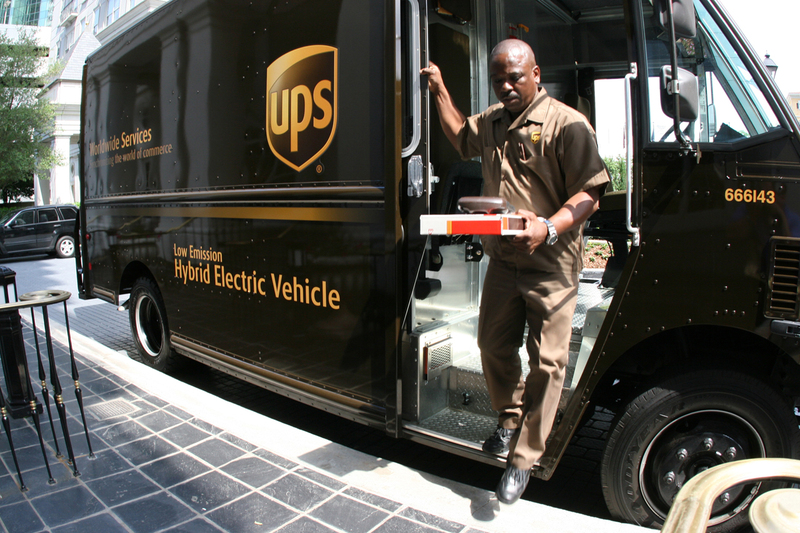 National services: UPS express & UPS express saver shipments should arrive in one business day. While the first solution is expected to arrive at 12:00 noon, the latter will generally be delivered by the end of the day. Freight Services: one to three business days for UPS Air Freight Direct, and three to five business days for UPS Air Freight Consolidated services. International services: the time frame for these type of shipments oscillates between 1 and 5 business days. If you opt for UPS Expedited you will receive the package within 2-5 business days. UPS Express and UPS Express plus arrive in 1-3 business days, and UPS Express Saver packages take 1-5 business days to reach destination. UPS has another cool shipment scheduling feature that allows the customer to choose the date and time when he wants the package to arrive at the front door. If you want all your parcels to be delivered at your address you have to take a good look at the details of every delivery option available. As you would expect, there is also an enhanced UPS track package feature available for retailers and serious buyers. Do you want to give your clients the information they need directly on your site or customize your own package tracker? You can do this with UPS’s Tracking API, which works in over 40 countries and provides real-time reports on international and domestic shipments. The API comes in both HTML and XML versions to cater for all needs, and can be personalized for local languages. Please keep in mind that the code of the API must be manipulated by Web service programmers in order to function correctly. You can find out more about it here. What can you do if the UPS Package Doesn’t Arrive on Time? A lot of strange things can happen during the shipment process: packages can get lost, damaged or delayed. Sometimes the UPS tracking system decides to stop working and it may feel like your beloved cargo got hijacked. Do not fret! First of all, if the package doesn’t look like it’s moving that can only mean one thing: it got stuck in the UPS network, and it will probably be delayed for a bit. Unless otherwise noted, the parcel should arrive at its estimated time of delivery. But what if it doesn’t? That’s simple. You contact the retailer employing the services of UPS and explain the situation. He is obligated to contact the carrier and clarify the situation. If the package was indeed not delivered you are entitled to a full refund. There are some situations in which packages appear as delivered, when in fact, they are not. The good news is that UPS uses Proof of Delivery to ID the person who accepted the parcel. If you’re package is delivered, but you are not home to pick it up, you can ask for a clarification, refund or take legal action. There have been several situations in which conspicuous brownies left packages at the door, or at neighbors. This is the company’s mistake, not yours. We hope that we managed to answer some of your most burning questions regarding UPS package tracking. If you have any more enquiries feel free to contact us. We will get back to you as soon as we can. Hey Buddy!, I found this information for you: "UPS Package Tracking Tips & Tricks". Here is the website link: https://all2door.com/ups-package-tracking/. Thank you.